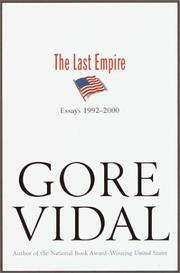 More political and literary essays from Vidal (The Golden Age, 2000, etc.). Vidal’s style is unmistakable: erudite, contrarian, self-aggrandizing, elegant. Cranky. Never has it been more Vidal-ian than here, in his ninth volume of essays, a collection of pieces written between 1992 and 2000 that occasionally borders on self-parody. By far the strongest works are the literary and historical sketches grouped at the beginning: witty, knowing, insightful, and carefully written, taken together they comprise a prickly tour of the midcentury world of American letters. The last 20 essays are far more problematic, however. In these Vidal rants endlessly about the National Security State and the American Empire, two self-identified postwar political structures that he claims have ruined everything good about America. If one hasn’t read Vidal’s take on these issues before, perusing one of these essays might be fun—but reading 20 of them is not. Although they have different titles and are nominally written on different subjects, the monotony of analysis is numbing. (Plus, it’s hard to take Chicken Little seriously when, after nine volumes, the sky still hasn’t fallen.) But no matter, there are plenty of fireworks in the literary and historical sections—most compellingly, in a wonderful riff on Sinclair Lewis that interlocks with a controversial defense of Charles Lindbergh in an attempt to revive an intriguing pre-WWII American icon: the plainspoken, isolationist, independent hero from the Great Plains. Amazingly, Vidal, for all his namedropping and urbanity, can’t help but see himself in this role. A similarly palpable identification warms, to fascinating effect, the pieces on writers as diverse as Cavafy, Dawn Powell, and Mark Twain. And a merciless attack on Updike is not only provocative but wickedly funny, a flash of the younger Vidal’s dead-on comic sense. Vidal’s gossip can feel as stale as his (very dated) political concerns, but few today have what he still displays in abundance: the desire, the intelligence, and the wit to continue living as a true man of letters.